· Very powerful against prostate and breast cancers. · Helps reduce the risk of cardiovascular disease by lowering LDL levels. · Guards against aging of the skin. · Reduces damage caused due to UV rays. · Clinically studied Lyc-O-Mato® lycopene. · Extracted from non-GMO tomatoes. · Contains other important carotenoids phytoene and phytofluene. As a dietary supplement, take two Softgel capsules daily with meals. Pure Olive Oil, Gelatin, Purified Water, Annatto Extract. Contains: Soy. No sugar, no starch, no sodium, no artificial flavors, no artificial colors, no corn, no wheat, no dairy, no yeast and no preservatives. A.Lycopene isn’t just one of the most popular members of the Carotenoid family; it’s also one of the most beneficial. Red in color, Lycopene is what essentially gives tomatoes their rich, ruby appearance, though it’s also found in watermelon, papaya, and pink grapefruit. Lycopene is primarily stored in the lungs and prostate, and has been shown to offer a wide range of health benefits, including cardiovascular support and fertility. Most impressive, Lycopene has been shown in a number of studies to eliminate one of the most damaging of all known free radicals - singlet oxygen radicals. These highly reactive byproducts of oxidation are formed during the metabolism of polyunsaturated acids and can be devastating to healthy cell membranes. A.Lyc-O-Mato® is an all-natural extract of red, ripe tomatoes. Lyc-O-Mato® is valued as a dietary supplement and functional food ingredient because it provides a full complement of tomato carotenoids and other nutrients to benefit good health. The synergy of the natural tomato lycopene, phytoene, phytofluene, beta-carotene, phytosterols, and vitamin E results in enhanced activity and this means greater health benefits for you. Q.How does Lyc-O-Mato® compare to just plain lycopene? A.Lyc-O-Mato® tomato lycopene complex contains all the natural richness of the tomato: lycopene, phytoene, phytofluene, beta-carotene, tocopherols and other important bioactive phytonutrients. Lycopene alone, from tomatoes or produced synthetically, can only deliver the health benefit of the lycopene, not the full benefit of the tomato. It is the synergy of the multi-phytonutrients found in tomatoes, tomato products and in Lyc-O-Mato® that is responsible for the health benefits that have been reported in epidemiological and clinical studies that were conducted on tomatoes and tomato products. Research effectively demonstrates that lycopene is not therapeutically effective when present at the relatively low levels normally found in the blood even after supplementation. Effectiveness at the low lycopene concentrations that are possible to attain, occurs only when the lycopene is presented along with other phytonutrients naturally present in tomato and tomato extract. This occurs because the presence of the other phytonutrients enhances the effectiveness of the lycopene. Also important from a practical health perspective are recent scientific findings indicating that lycopene bioavailability is enhanced by the presence of the other natural phytonutrients that are found in the Lyc-O-Mato® tomato lycopene complex. Q.Who should take supplements containing Lyc-O-Mato® ? A.Lyc-O-Mato® is a dietary supplement recommended for adults as a valuable part of a daily health care regimen that includes a healthy diet. Research has shown Lyc-O-Mato® helps support prostate, heart and skin health, and helps protect the cells from damage from free radicals. Lyc-O-Mato® is particularly beneficial to smokers and to all of us who are exposed to environmental pollutants which increase the risk of damage from free radicals. Finally, because the natural mechanism that protects us from free radicals weakens with age, older adults need to ensure that tomato phytonutrients are a part of their daily diet. Q.How do I know that Lyc-O-Mato® is safe to take? A.Lyc-O-Mato® tomato lycopene complex is a natural extract of tomato. Nothing has been added to the goodness of the tomato that nature has provided. Generations of people have safely consumed tomatoes as part of their normal diet. Lyc-O-Mato® has also undergone extensive checks for safety. An independent evaluation of the safety studies has validated that Lyc-O-Mato® is safe for its intended use as a dietary supplement. 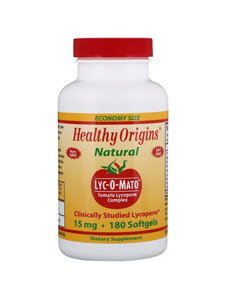 Lyc-O-Mato® contains only tomato extract produced from ripe non-GMO tomatoes. Lyc-O-Mato® is produced in following very strict quality assurance guidelines. Q.Why is Lyc-O-Mato® standardized to lycopene content? A.Lycopene was chosen as the marker for standardization because its unique molecular structure makes it a highly effective antioxidant and biological quencher of free radicals. Standardization assures you that each and every capsule of Lyc-O-Mato® contains the same quantity of lycopene in addition to a natural ratio of all the other important bioactive phytonutrients found in the tomato lycopene complex. Q.What does the latest research on Lyc-O-Mato® say? A.Scientific research has established that carotenoids, like the lycopene, beta-carotene, phytoene and phytofluene and other tomato phytonutrients found in Lyc-O-Mato® , act in synergy to, and play a vital role in helping to, maintain good health. Clinical research clearly indicates that Lyc-O-Mato® helps to support prostate and heart health and helps to protect our skin from the oxidative stress caused by free radicals produced when we are out in the sunshine.